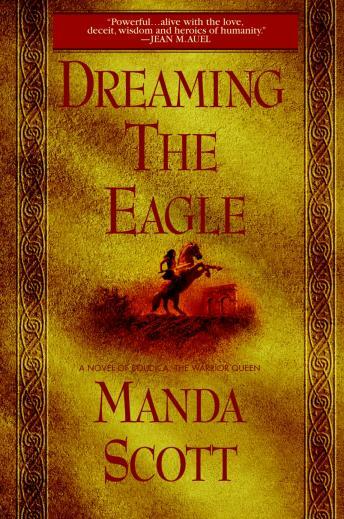 Dreaming the Eagle is the first part of the gloriously imagined epic trilogy of the life of Boudica. Boudica means Bringer of Victory (from the early Celtic word “boudeg” ). She is the last defender of the Celtic culture in Britain; the only woman openly to lead her warriors into battle and to stand successfully against the might of Imperial Rome—and triumph. It is 33 AD and eleven-year-old Breaca (later named Boudica), the red-haired daughter of one of the leaders of the Eceni tribe, is on the cusp between girl and womanhood. She longs to be a Dreamer, a mystical leader who can foretell the future, but having killed the man who has attacked and killed her mother, she has proven herself a warrior. Dreaming the Eagle is also the story of the two men Boudica loves most: Caradoc, outstanding warrior and inspirational leader; and Bàn, her half-brother, who longs to be a warrior, though he is manifestly a Dreamer, possibly the finest in his tribe’s history. Bàn becomes the Druid whose eventual return to the Celts is Boudica’s salvation. Dreaming the Eagle is full of brilliantly realised, luminous scenes as the narrative sweeps effortlessly from the epic -- where battle scenes are huge, bloody, and action-packed -- to the intimate. Manda Scott plunges us into the unforgettable world of tribal Britain in the years before the Roman invasion: a world of druids and dreamers and the magic of the gods where the natural world is as much a character as any of the people who live within it, a world of warriors who fight for honour as much as victory, a world of passion, courage and spectacular heroism pitched against overwhelming odds. Dreaming the Eagle stunningly recreates the roots of a story so powerful its impact has lasted through the ages. I found this book very hard to follow and just didn't like it. I kept listening, hoping it would get better, but it just did not live up to the potential of the story-line. Actual background given on book cover would have been helpful. The strong accent of the narrator made understaning difficult. Good story-hard to listen to.